This week we take a look at crystal and caramel malts used in home brewing and commercial brewing. 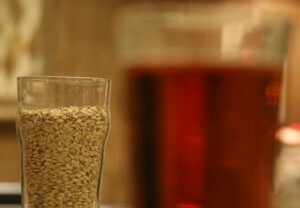 Caramel malt is a staple in a wide variety of beers worldwide, and is used to add color, flavor and sweetness to beer. I’m going to discuss how caramel malt is made, as well as when and how to use it in brewing beer. Note that the terms “Crystal” and “Caramel” malts are used interchangeably. Though crystal malt is strongly associated with English Ales, Stouts and Porters, it was first used in Mild ales and Strong ales, and was not widely used in Bitters until after WWII. In fact, most historical beers derived their color and flavor from Brown malt, good examples of which are difficult to find today. The later adoption of Crystal malts in many English beer styles was done to restore the malty flavor and dark colors provided historically by brown malt. Though crystal and caramel malts are used in just about every bitter today, crystal malt saw very limited usage until after World War I. Barclay Perkins first used it in 1942, Whitbread in 1928, Lees in 1946, etc... Today, however, crystal and caramel malts are used extensively in English and American ales, as well as many other beer styles worldwide. Caramel and Crystal malts are produced separate from pale malts. They are typically made from high nitrogen barley that is first soaked in water and then germinated. Where regular pale malt is next dried and kilned at low temperature, caramel malts are instead left wet and heated to typical mash temperatures of 150-170 F (66-77 C) for a few hours at high humidity. This effectively “mashes” or converts the sugars while they are still in the grain. Next the caramel malt is roasted at a higher temperature of around 250F (121C) until the desired color is reached – caramelizing the sugars. This also removes the remaining moisture. By varying the roasting temperature and length, maltsters produce the full range of caramel malts. These can vary from very light cara-pils malt to very dark Caramel 120, Carafa malts, and Cararoma malts, and even Special B. Some of the very dark caramel malts are dehusked to cut down on astringency and tannins, as very dark caramel malts can be very bitter and create off flavors. In fact you may notice that there are relatively few malts produced in the range of 130-300 SRM – which is the gap between the caramel family of malts and the start of the roasted family with light Chocolate and Roast Barley. This is because crystal and roasted malts in this range produce too many undesirable flavors in the finished beer. Before we go into each caramel malt, you need to know that Caramel and Crystal malts have no diastatic power, so they are to be used as an adjunct and never a base malt. Also many of the sugars in the malt caramelize during roasting, and become unfermentable which is why caramel malt adds sweetness and body to the finished beer. Carmel/Crystal malts also improve the head retention of a finished beer. Those kilned at higher temperature generally have a stronger caramel flavor. Generally caramel makes up 2-15% of the grist, but in some cases may be slightly higher. There is a strong tendency, especially with beginning brewers, to overuse and even abuse caramel malts by simply using too much. Caramel malts should properly be used for their body and flavor and some color where appropriate, and should be used in small quantities. Rarely should the total caramel malt exceed 10% of the grain bill, and 5% is probably a better target. Don’t add a rainbow of caramel malts – select the one you need and use it. Also, use the darker caramel malts sparingly – as the color approaches 100 SRM, these malts get increasingly astringent, and have a more burnt flavor, which can often destroy the flavor balance in your beer. Moderation is the key. Carapils, Carafoam, Dextrine Malts: At the low end of the scale we have Carapils, Dextrine malt, Carafoam which are roughly equivalent (note some of these are brand names) with a color of around 1.5-3 L. These are the lightest caramel malts, made from light pilsner malt and roasted slowly at very low temperature. They do not have strong caramel overtones, and very little color so these are primarily used to add body and head retention to the finished beer. Light Caramel Malts (10-30 L): These malts impart a light honey-like sweetness as well as body to the finished beer. They also add some color to the finished beer, usually a light straw color if used alone. They are not as sweet or caramel flavored as the darker variations. Medium Caramel/Crystal (40L-60 L): These are the most commonly used caramel and crystal malts. They impart a measurable sweetness and caramel flavor to the finished beer, which you can taste even by sampling the raw malt. These are well suited for many English and American style milds, porters, stouts and bitters. They also add significant body and head retention to the finished beer. Dark Caramel/Crystal (70-90 L): These malts add a much darker color as well as caramel flavor. Due to the high roasting level, some bitterness is also added, creating a bitter-sweet finish. The finished color can show hints of reddish tint, depending on the level of malt used. These also add body and head retention and are used most often in darker beers such as Porters and Stouts. Very Dark Caramel/Crystal Malts (100-220 L): These include not only dark Caramel malts such as Caramel 120, but also custom specialty malts like Carafa I, Carafa II, and Special B (which is very dark at 220 L). These malts add not only significant color and caramel flavors, but also often include a bitter, nutty somewhat roasted flavor. They should be used sparingly (1/8-1/2 pound max per 5 gal/19L), as the bitterness can easily overwhelm a beer. Large amounts can lead to a bitter, plum like flavor. Some variations such as Weyermann’s Carafa are dehusked to reduce the bitter off flavor. I hope some of these tips help you understand and know when crystal or caramel malt can be used in your beer recipes. Thanks for joining me on the BeerSmith Home Brewing Blog. Be sure to sign up for my newsletter or my podcast (also on itunes…and radio station) for more great tips on homebrewing. > Carmel/Crystal malts also improve the head retention of a finished beer. Charlie Bamforth (on a recent episode of The Brewing Network’s “The Session”) said that he conducted an experiment with a range of crystal malts and, to his own surprise, found most were actually detrimental to head retention. If memory serves correctly it was only one or two of the lighter crystal malts that were were OK in this respect. I’ll defer to Charlie, but in general crystal malts do add body to the beer. Head retention and body should not be mutually exclusive (though that may just be in how I interpreted Brad’s response). I think it should be mentioned that caramel and crystal are not the same. Per Briess: “Caramel Malt” is applied to both kiln and roaster produced caramel malts, but the term “Crystal Malt” is normally reserved for caramel malts produced in a roaster”. I was always under the impression that all Carafa (Weyermann) malts were roasted malts. I also thought Special B was 120-150 L.
Nice article but I am a bit confused. You say in one paragraph that you can use up to 15% (2 to 15%) of Carmel malt but later say use no more than 10%. Can you explain that? Re 2-15% figure….I took it that Brad was referring to the actual amount of sugars which were converted to caramel during the production process(and therefore unfermentable), not the amount of caramel malt in the grain bill, which he later states should be no more than 10% and preferably 5%. So that the lightest caramel malt might have 2% caramelised sugars and the darkest up to 15%. But I might well be wrong. I am looking forward to reading a similar article on roasted malts. On a the NEIPA episode of your podcast, Michael Tonsmeire suggested steeping some crystal malts instead of mashing with them. Would you reccomend leaving the crystal malts out of the mash? Another very good review article, Brad. Thanks. I’m trying to perfect my brown and red IPA recipes, and selection of the right crystal malt is a basic issue for both. I’ll keep trying. I have learned that the specific maltster can be very important, and the flavor from a similar Lovabond crystal malt can be a good bit different. I’ll just have to keep trying.